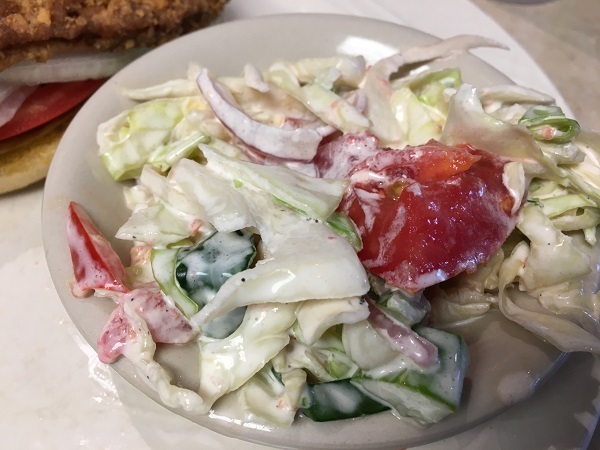 Countryside Cafe, Ooltewah TN – Marie, Let's Eat! Several people have recommended this meat-and-three about fifteen miles from our house. But when we finally made it here, I abandoned my plans for a great big lunch after I saw what was on the menu. There are still more than a dozen places on our local to-try list, but this has been a cruel summer. Uninspired and unhappy, I haven’t been in the mood to explore very much. We’ve just been revisiting restaurants that we know that we enjoy. One of these has been Dub’s Place in Red Bank. One Tuesday, I went that way for lunch, intending to have a crumble burger and a shake. Then I opened the door and saw a promising special on the board: a breaded pork tenderloin. If you’ve ever visited Dub’s Place, then you’ve probably met the Captain, who bought the aging old dairy bar and turned it into a must-visit destination. He was working on some invoices with the cashier. “Tell me about that tenderloin special,” I said. “Yeah, you want that,” he replied. He told me how I’d want it dressed, and about the mild horseradish sauce that I would also want. I eat here frequently; I do what the Captain tells me to. And it was a darn good sandwich. 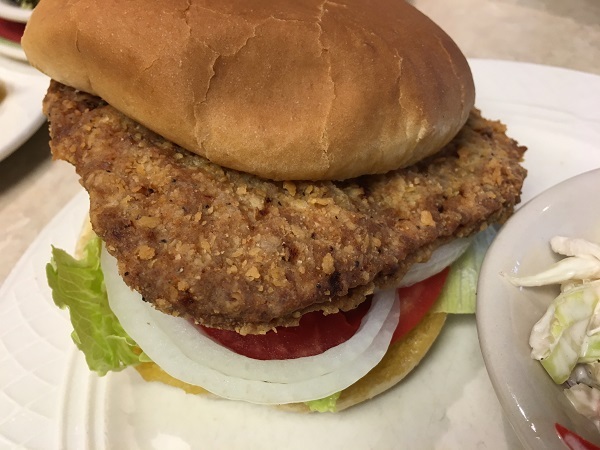 I’m not sure that it would thrill residents of Iowa or central Indiana, who are used to the mammoth tenderloins that the Des Loines blog champions – seriously, go see these pictures – but it was a good sandwich. I left mildly grumbling that I still wanted a crumble burger, but I left happy. 20 Southern meat-and-threes to try before you die. I don’t deny a little envy for her travel (and expense account), so I definitely jumped to read that story. There was a listing for Countryside Cafe, which is across the street from Kevin Brown’s Burgers at a crossroads that is still kind of in Ooltewah but is almost in Cleveland. People keep telling us to visit this place, and so we did, and there, on the menu, was another breaded pork tenderloin. Countryside Cafe opened in 1990 and has been winning awards from newspapers and community organizations ever since. We arrived on a Saturday for lunch a little after eleven and the place was really busy, the servers buzzing around tables like parts of a finely-tuned machine. Ours took the requisite few minutes necessary to explain the menu. It’s divided into sections, with about half their offerings available daily, and others periodically. Dry erase boards let guests know which of the limited time offerings can be had, along with the daily dessert menu. As the photos show, Marie went with a four-veggie plate, and I closed the menu as soon as I saw they had a breaded pork tenderloin sandwich. I did ask whether this was breaded and deep-fried here, but what I probably should have done was pulled up a picture from Des Loines and asked “That. Does it look like that?” Because, if you clicked that link above and compared it to that thing with the lettuce and tomato sandwich that you see here, it’s like night and day. Again, a good sandwich, but not what the legend suggests. But that’s okay, because Marie ordered the best potato salad in the universe. I’m not kidding. 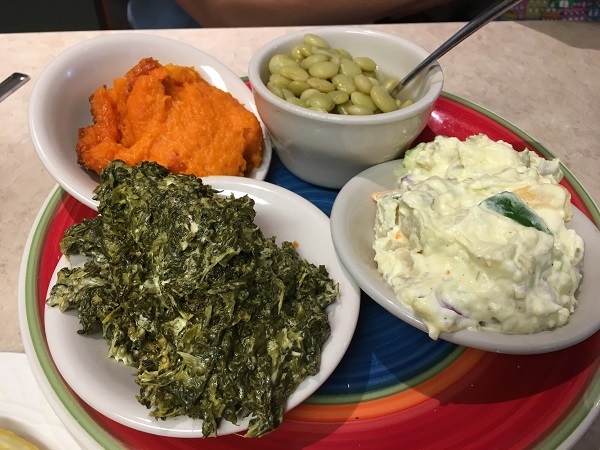 She was also crazy about the carrot souffle, and I had the slaw salad with mine, and it was also incredibly delicious – check it out, below – but that potato salad was like an out-of-body experience. Admittedly, it’s been a long time since I’ve had really great potato salad. I never order it; it was the concession I made seven years ago when we started this blog, that if I was going to eat more than I used to in the name of research, then I had to be sensible about a few things, and the billion calories and carbs of potato salad had to go. And then, the week before we came to Countryside Cafe, I decided that I’d treat myself. So I mentioned above that this has been a cruel summer. If you read us regularly, then you might can see some undercurrents and see that we don’t post as often as we once did. Once upon a time, we visited scores of new-to-us places and wrote about every single place unless we were either really, really uninspired or just downright annoyed. Well, we’re uninspired a lot more than we used to be. Maybe you’ve read between the lines. There’s a lot about Chattanooga that we really and truly like a great deal, but jobs and friendships and goals have not gone the way we wanted. We’ve been trying to stay positive and I’d like to think that we’re making an effort, but this damn city is taking a lot out of me, no matter how much I enjoy putting on my hiking boots and stomping around the Cumberland Trail and Lookout Mountain. And so, one Saturday, when Marie and our son were out of town and I was in a black, black mood and desperate for some barbecue that I could write about with passion and feeling, I went to the one barbecue place on our to-try list that I’d been saving for a rainy day, knowing, just knowing that it was going to knock me off my chair. And it did. I had the chopped pork with mustard slaw and potato salad, treating myself because Tennessee tradition be damned, I am sick to the back teeth of baked beans, and it was just about the worst plate of barbecue I think I’ve ever had. And that potato salad. That awful, awful potato salad. Then we risked dessert. Good for us, because they make the best peanut butter pie in the universe here as well. 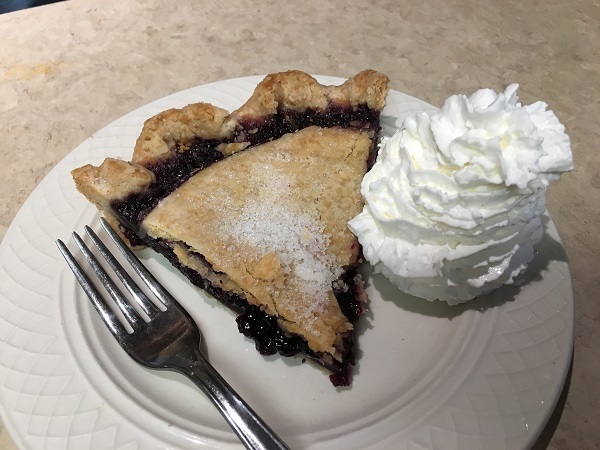 Marie was really, really pleased with her blueberry pie, and she’s been baking a lot so she’s developed a greater appreciation for what goes into a good dessert. Me, I like fruit pies just fine, but what I really like are peanut butter, chess, or shoofly. This was a masterpiece. 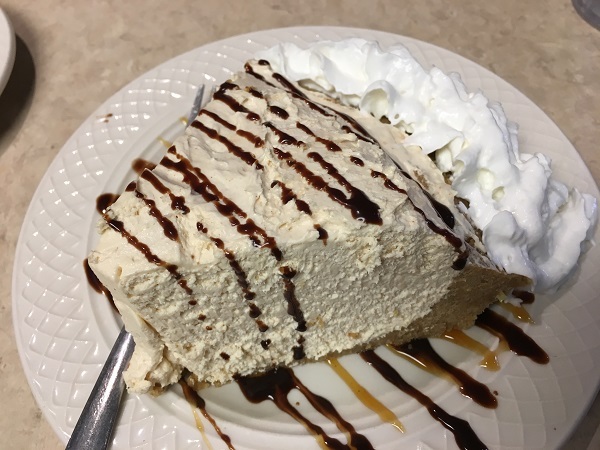 I would gladly accept the weight gain from eating seven slices of this peanut butter pie every single day. We’d already decided that the artificial requirements of this blog’s posting schedule had to end. We have been digging for inspiration, repeating ourselves, and making allowances for the sake of talking and championing. We decided years ago that small businesses needed to be championed, and I still believe that. Even if we don’t leave a restaurant punching the air, we’d still like to tell a story and introduce people to new restaurants. Maybe a few hundred readers could help an independent mom-n-pop out. But I think we’ve been forcing the issue too much in order to keep a schedule, which is what they say blogs need. With that in mind, we’re not going to keep to a schedule anymore. When we find real inspiration, a story will come naturally and we won’t labor over writing it. Countryside Cafe is as real an inspiration as there is. Posted on August 29, 2017 August 29, 2017 by Grant G.Posted in chattanooga, dessert, southern, tennesseeTagged breaded pork tenderloin, chattanooga, dessert, ooltewah, potato salad, southern, tennessee. You know that’s kind of the same reason that Davwud let his blog peter out. Negative people, blah restaurants, etc…..Hope that things turn around for y’all in Chattanooga if not you always have Champy’s to drown your sorrows in. Sorry I really like the place, lol.